Froggys Fog Pro Snow 600 lets you decide how much snow you want and you control the flake size. You can have a small snow flurry or a massive snow blizzard. This kind of control is only found on high end snow machines that can cost from $500.00 all the way to $2000.00. We put it in a package that is perfect for every one from a home enthusiast to the professional stage show. We at Froggys Fog saw the problems with all the other budget snow machines on the market (1 speed or 2 speed pump that really did not give you the snow that is right for your environment) and set out to give the you something that works. What we know from our year in the snow business is that every snow environment is different. You may be outside and mount the snow machine 15 feet in the air on top of the roof and need larger flakes or you may be inside or on stage where controlling flake size is essential to making sure the scene is perfect and your Froggys Flakes Extra Dry Snow Fluid evaporates perfectly before it hits the ground. 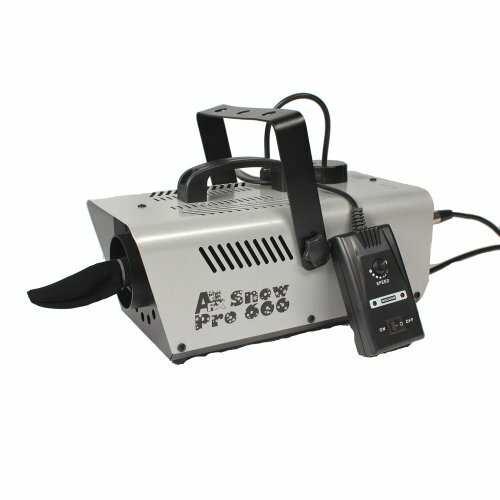 0%-100% Completely Variable Output Snow Machine - This is the best machine you can buy for the price.